Monday was technically the 30th anniversary of the USA's win over the USSR in Olympic hockey, but as far as I'm concerned today is the real anniversary. That's because it was the second Friday of the Olympics when that game was played. I was reminded of that greatest ever day for an American sports fan when I came across this, which then reminded me of worst ever decision by a network broadcaster. That was when ABC decided NOT to show that game, THE GAME, live, but rather on a 3 hour delay. It's funny how the mind plays tricks on you, isn't it? I've seen that clip of the final minute with Al Michaels counting it down so many times that I sometimes forget that I didn't see it happen live, didn't really enjoy the thrill that I should have enjoyed because I knew who had won before ABC came on air. It's only when I really think back on it that I remember following the game through our cable system's score ticker on the local access channel. I remember being really angry then - I was 15 - and you know what? I still feel cheated. I was wrong. Instead of hockey they're showing the men's 4 x 7½km biathlon relay. I admire the great Ole Einar Bjørndalen as much as anybody. 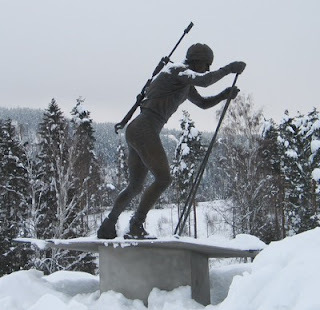 Well, as much as any non-Norwegian (see picture of statue of him from his hometown; pic from Panoramio). Okay, as much as any non-biathlete North American fan. Satisfied? Actually I really like watching the biathlon (every four years). Great skills, great endurance, great competition, great sport. I've watched a lot of biathlon this Olympics, but tonight I really, really want to watch hockey. Unfortunately, it looks like it'll take a miracle for me to be able to see tonight's game.